Merrie Way overlooks the ruins of Sutro Baths, and is something of a mystery to modern-day park visitors. Although provided with a city street sign, it doesn't look much like a thoroughfare. A dead-end dirt parking lot, scoured by Pacific winds and bordered by glowering cypress trees, there certainly isn't anything about it that's "merrie." But 110 years ago, Merrie Way was the site of one of Adolph Sutro's many recreational developments near the Cliff House--a mini-amusement park, complete with rides and midway attractions, Sutro's "Pleasure Grounds." As most Sutro buffs know, Adolph Sutro developed an extensive series of attractions at the western edge of the city's "outside lands" during the 1880s and '90s. The core of his holdings was his home and gardens at Sutro Heights, but his developments eventually grew to include the Cliff House, an outdoor aquarium, Sutro Baths, numerous adjacent shops and cafés, and a street railroad that brought visitors to the area. He also owned hundreds of acres of surrounding dunes, an area known today as the Richmond District. Sutro, an investor who could never quite pass up a bargain, included many recycled buildings and attractions in his growing empire. For example, when the famous Woodward's Gardens auctioned off its holdings in 1893, Sutro bought thousands of dollars' worth of "stuffed beasts and birds, relics of the past, curios, bric-a-brac, etc." He also acquired the benches, the pipe organ, and several statues, and brought all of it over to his new Sutro Baths. As construction of the Baths continued, Adolph Sutro found another opportunity to pick up attractions at bargain-basement rates when the 1894 Midwinter Fair sold off many of its holdings. Sutro purchased several rides and attractions from the fair and had them moved from the fair site in Golden Gate Park to a recently cleared area just east of the Baths, today's Merrie Way. 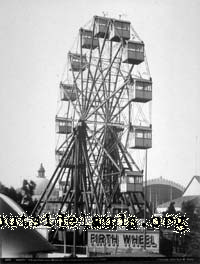 There, along a central midway, Sutro had three of the fair's most popular attractions reconstructed as the "Sutro Pleasure Grounds." The centerpiece attraction was the 100-foot-diameter "Firth Wheel" with its 16 carriages, which took passengers on 20-minute rides high over the Sutro Baths to view the Pacific Ocean. Across the street were two indoor attractions: the "Mystic Maze," a house of mirrors similar to those still found in many amusement parks, and the "Haunted Swing," a full-scale optical illusion--visitors entered a large, furnished room, sat down on a glider-type swing in the center, and began gently swinging. Unknown to the visitors, the entire room, which was set on gimbals, would also begin swinging in the opposite direction, giving the people in the glider the illusion that the room was rotating around them. The experience was reported to be very, very unsettling. Not much is written about the operations of Merrie Way, but its evolution can be tracked through historic photographs and maps of the area. By 1898, the midway had grown to include an embryonic roller coaster called the "Scenic Railway," a curiously named ride called the "Springs on Platform," and a cluster of chowder stands built from kiosks also recycled from the Midwinter Fair. At some undetermined point, the Pleasure Grounds' midway was formally named "Merrie Way." The Pleasure Grounds must not have been long-lived, though, since by 1900 the official insurance maps of the Sutro Baths showed all the Merrie Way attractions labeled "closed" or "not in operation." The last photo of the amusement complex, taken in 1910, shows the weather-beaten Wheel and the Swing and Maze buildings overlooking the Baths bisected by a deserted midway. 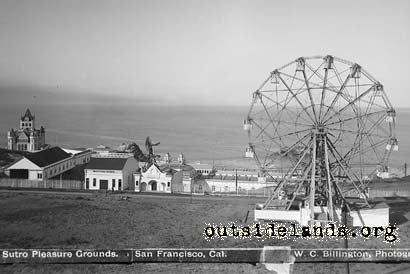 The records don't officially record when the wheel and other attractions were torn down, but photographs of the Sutro area taken after 1923 show only cleared land where the complex once stood. The name Merrie Way persisted on city maps and street signs, though, despite the fact that the sandy roadway provided few clues to the festive attractions for which it had been christened. Around 1954, Merrie Way was enlarged by the city as part of a never-completed renovation of the area above Sutro Baths. The former midway became an open parking lot with dimensions larger than a football field. Today, the midway is a memory, joining the Bella Union Hotel, Woodward's Gardens, the Chutes on Haight, Tivoli Opera House, Seals Stadium, and Playland at the Beach on the list of lost-but-not-forgotten San Francisco pleasure sites. Future plans for Merrie Way call for the construction of a new National Park Service visitor center in the area, and the grading and paving of a parking lot designed to provide safe parking for buses and cars bringing visitors to the area. And the name at least--with its origin in a 14th-century Scottish admonition to "ave ye a goot day, und eat, drink, an make merrie"--lives on. Images: 1) Firth Wheel at the California Midwinter International Exposition, 1894, by I.W. Taber, (Courtesy of the Bancroft Library, University of California - Berkeley); 2) Merrie Way about 1897, by W.C. Billington, (Courtesy of John Martini). Page launched 30 December 2004.